The Fox family, of Clareville, Avalon and Bayview, were contributors to community, dating from prior to Avalon acquiring its name through the efforts of Mr. Arthur J. Small and his visions of the green valley and through the 1930's, when the Depression may have made life difficult for many. It was during this era that The Fox Trophy, as part of local rowing events, makes its appearance. DOWN AT AVALON. Three clubs — Collaroy, North Narrabeen, and Newport — made Avalon Beach their rendezvous last Sunday for the purpose of giving instruction to the new local club. Mr. Ramsay Sharpe was in charge of the teams, who were welcomed by Mr. Small, Dr. Hanson, Mr. Fox, and other residents of Avalon. An interested spectator of the general proceedings was Mr. Ruskin Rowe, one of the pioneers of Freshwater Club and now a member of Bondi. With a view of stimulating interest Mr. Rowe has offered a prize of £2/2/to the first Avalon member qualifying for the bronze proficiency medallion of the S.L.S.A. Men's Best and Best Handicap (1 ½ m), for Fox trophy.-C. Mudie, 60s, 1; F. Kerr, 40s, 2; H. Erickson. 30s, 3. Won by two lengths. Women's Gladstone Skiff Handicap (1m).-Miss M. Riddle, 22s, 1: Miss J. Gilroy, scr, 2; Miss I. Nilsen, 32s. 3. Won by half a length. The Story begins a few decades prior to this though. Henry Leslie Fox married Julia Maud Sharples (born 1878 Broughton, Lancashire, Baptism: 8 Sep 1878 St Luke, Skerton, Lancashire, England) in Salford, Manchester in 1903 at the Salford Register Office. Julia Maud (Julie or Maud sometimes) was the daughter of Solomon Sharples and Julia Sharples. Solomon Sharples is listed as 'Engineer' under the Occupation section of this church record. Earlier Solomon Sharples's occupation is listed as 'machinist' in the records of Baptisms at St Saviour in the District of Chorlton-on-Medlock, Manchester where he and Julia's first two children of many are recorded: John Henry Sharples - [Child] of Solomon Sharples & Julia, Born: 23 Sep 1867, Abode: 5 Cheltenham St., Occupation: Machinist, Baptised by: C.N. Keeling - Register: Baptisms 1866 - 1887, Page 26, Entry 205, and Baptism: 9 May 1869 St Saviour, Chorlton on Medlock, Lancs. Lucy Julia Sharples - [Child] of Solomon Sharples & Julia, Born: 26 Mar 1869, Abode: 5 Cheltenham St. Occupation: Machinist, Baptised by: C.N. Keeling - Register: Baptisms 1866 - 1887, Page 26, Entry 206. St Saviours, an Anglican church, was founded in 1851. This was just after the years called The Lancashire Cotton Famine, or the Cotton Panic (1861–65), which was a depression in the textile industry of North West England, brought about by overproduction in a time of contracting world markets and coinciding with the interruption of baled cotton imports caused by the American Civil War. Right: An 1862 newspaper illustration showing people waiting in line for food and coal tickets at a district Provident Society office. Interestingly Solomon Sharples father, John Sharples (born circa April 4, 1814 in Greater Manchester) emigrated to Finland with his family in 1846 and was employed as weaver master at Finlayson cloth mill in Tampere, Finland until his death in 1876. Some of Solomon's daughters are listed, in church marriage records, as 'Cotton Warper', 'Factory Operative' and trades associated with the cotton mills of Manchester, Lancashire. In 1904 Henry Vincent (Vincent Henry) Fox, the first son of Henry Leslie and Maud Julia Fox was born at Ardwick in Lancashire. 1904 is also the year Solomon Sharples passed away, at aged 65, at sub-district Cheetham in Manchester. A search of the Genes Reunited website, which provides listings of many things, among them Passenger Lists of people leaving the UK 1890-1960, discloses two members of the young family moved to Australia as part of a contingent of hopefuls who came to Sydney aboard the Tahiti, exit port Glasgow, via Plymouth, in 1911, arriving 10 a.m. November 25th, at the Union Company's Margaret Street wharf. The passenger lists show Mrs MAUD J Fox and MASTER HENRY V FOX. In a report of the passenger's lists and the arrival, due to the Tahiti representing the commencement of a 'Sydney-New Zealand -Frisco mail run' it is stated there are 75 children aboard and many of these are being greeted by the head of the family who has come out to Australia prior to these family members, probably to ensure a more comfortable arrival for those who followed. The family initially settled at Orange where Henry Fox was working, apparently on a property there. Taking a lady fresh from early Winter in England to early Summer and then a full Summer in Orange, Australia, may have been a too big a shift in terms of weather and social isolation even if Orange town in 1911 is recorded as a place with a population of 7000, only a few hundred miles from Sydney by train and with a healthy climate due to being 3000 feet above sea level. 1911 was also the year that commenced the 1911-1916 Australian Drought however - poor Maud may have wondered what she had landed in! "She hated it, because when she came out from England my father took her out to Orange and my brother had never been on a horse and he had to learn to ride a horse to school. She said 'I’m not staying here. I can’t stay here', she said. 'I can’t have my son riding to school on a horse' and so that is when they came down here." The Fox family moved to Careel Bay, Pittwater, where Henry (sometimes Harry) became a caretaker, the family residing in the caretakers cottage. Among the interview conducted through SHOROC Sophie mentions her mother being friends with a chemist, a Dr. Elliott, who owned the property on which the caretakers cottage was, a gentleman who resided or had his business in Sydney (town). As Mrs. Williams was in her 80's when this interview was conducted and the history she relates dates from a time when she was still a small child, searching in previous records, such as those found for Careel Bay Wharf and Boatshed (see Careel Bay Steamer Wharf and Boatshed), shows a sketch of Careel Bay from 1900 to 1917, when the Fox family moved to Central Road Avalon. The 'chemist' who had property at Careel Bay named 'Dr. Elliott' during these years was James Frederick Elliott, and the property he owned, expanded later but which still exists, was 'Marara'. Caretakers were employed either as full time residents or as locals who would check on places as the popularity of Pittwater as a weekend resort, and weekenders being built, brought those who toiled in the city for a few days of fresh salt air, quiet and green views relief. One example of a man who came into the area to break into weekenders, or tents, and steal, is placed under References and notes (below). Primary Application - James Frederick Elliott 29 acres 11 roods 35 1/4 perches in Bay View & River View Roads & on Careel Bay & Pittwater in Parish Narrabeen County Cumberland Shire Warringah Volume 3952 Folio 98 Date range: 13/04/1926 to 23/12/1926 (From State Records of NSW). LATE DR. ELLIOTT. The funeral of Dr. James Frederick Elliott took place privately at the South Head Cemetery yesterday. One of the leading pharmaceutical chemists in Australia, he found time, in a crowded life, to engage in many commercial and other activities. The second son of the late Dr. George Robinson Elliott, who founded the firm of Elliott Bros., Ltd., the late Dr. J. F. Elliott was born in Elliott-street, Balmain, in 1857, and was educated at the Sydney Grammar School. For his technical education he proceeded to London, thence to Germany. Returning to Sydney, he was appointed to the position of pharmaceutical chemist to Elliott Bros., Ltd., and he designed the laboratories at Rozelle. He also occupied the position of scientific director of the chemical works of the company, succeeding the late Mr. James R. Elliott as managing director of the chemical works and laboratories. In these positions he had great opportunities of showing his ability as a chemical engineer, and under his supervision great progress was made in the manufacture of sulphuric and other mineral acids, and also the manufacture of superphosphates and other chemical manures, He was a leading authority on all pharmaceutical matters and chemical engineering and was a life member of the Pharmaceutical Society of New South Wales. J F Elliott appears in the above image in back row, second from left (courtesy RSYS archives). The RSYS members, alike the foundation members of Pittwater's RPAYC and RMYC - Broken Bay, were captains of industry or at the top of their field. Sailing races to Pittwater, Pitt Water as a holiday destination were a clear and obvious choice. J F Elliott chose Careel Bay as the site for their 'Pittwater base'. Under Instruction from THE EXECUTORS OF ESTATE OF THE LATE Dr. JAMES FREDERICK ELLIOTT, "MARARA." CAREEL BAY. near PALM BEACH. OCCUPYING a sheltered position, commanding a wide range of enchanting views if the picturesque Inlets of Pittwater, its shores, and headlands. An ideal Waterside Bungalow of attractive design, built of specially selected mahogany weatherboards on massive stone foundation, WITH DOUBLE ROOF and shingles over iron, to ENSURE A LOW TEMPERATURE. It contains: Living-room, 25 x 10, with inglenook. In addition large plate glass observation window, and is fitted with built-in bullet and cabinets, four bedrooms, each with lavatory basin fitted therein, supplied with running water, modern bathroom, with lavatory, kitchen with stove and sink, hot and cold water service, etc. Verandah in front. 33 x 12. Verandah at rear. All windows and doors fitted with copper wire flyscreens. Delco Electric Light Installed throughout, Telephone. The water supply Is a special feature, having a storeage capacity of '60.000 gallons, with special Reserve supply for household purposes, connected to bedrooms, bathroom, and kitchen. DETACHED LAUNDRY, fitted with up-to date appointments, storeroom. ON THE WITERFRONT Is a BOATSHED, with man's quarters over, comprising living-room, large bedroom, kitchen (stone), separate water supply. SHARK-PROOF SWIMMING BATH. 130ft, x 40ft. Substantial Hardwood Wharf, Other improvements comprise: Motor Garage, Cow Shed. Fodder Bins, Poultry Run, Septic Tank. THE LIND COMPRISES AN AREA OF 28 ACRES 8HOODS 0 PFRCHES. TITLE TORRENS. HAVING FRONTAGES to CAREEL BAY. BAYVIEW ROAD AND RIVERVIEW-ROAD, about 4500 FEET t o EXISTING ROAD?. A tale associated with one of the 'caretakers' that followed Henry Leslie Fox's supervision of this property during the ownership of Dr. Elliott runs under References and notes - a dastardly tale and act if true! Residing at Careel Bay full time when the Fox family were resident were the Wilson and Hastie families. The Wilsons were fishermen and also very good rowers. It may be then that Vincent was introduced to the pleasures of being in a boat on Pittwater. It was while residing at Careel Bay that Sophie Iris was born on October 20th, 1912 at Waverly Hospital and brought home via steamboat. The Fox family moved from Careel Bay to Central Road, Avalon around 1917, when Sophie was around five years of age. Her father was still building the cottage they would live in, and would go on to make a living as a builder. This structure still stands in Central Road, towards the Clareville end. "Mum's younger brother, Neville, was born there and mum didn't leave the family home till she was married. Mum's house at Avalon sat on a large parcel of land that extended right to the top of the hill. They grew fruit trees, vegies, and had ducks, cows, pigs and chickens. They were mostly self sufficient because all provisions had to be bought in by steamship from Sydney. This included all the family's clothes, kerosene for lighting, matches, sugar, tea, soap etc. They also had tanks for fresh water. Mum went to school by the ferry. It used to pick her up from Clareville at 7 in the morning then continue on to Palm Beach, the Basin, Scotland Island right around Pittwater and ending at Newport Wharf where she then walked to Newport School. By the time she arrived back home in the evening it was 6 o'clock. Once mum had completed school, although she would have loved to have gone to work, her father didn't think it was appropriate so mum spent her time helping her mum with home duties — which included mowing the lawn with a hand mower, sewing clothes etc. 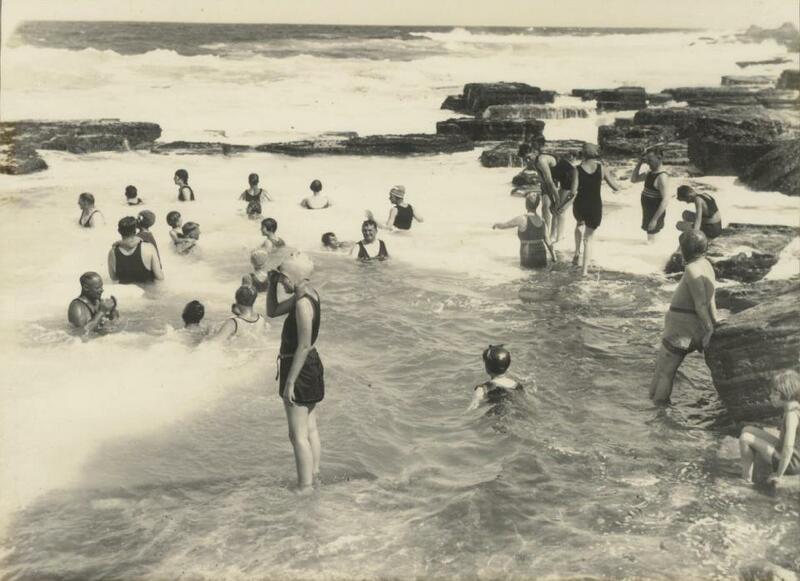 Mum also loved to spend a lot of time at Avalon beach, swimming, sunbaking and surfing." Sophie: "...we would go up the hill and it was covered in flannel flowers and bush flowers and they were beautiful. " Neville was born June 13th, 1918, his birth registered at Manly according to his WWII Enlistment papers. In her account for the SHOROC piece Sophie recalls that her father had 'been used to money in England' and 'he built about three houses', although this work was scarce during the Depression years. What shows most visibly, still, apart from their outstanding abilities in fashioning vessels, Vincent being a boatbuilder at Bayview with the Williams, Neville becoming a Marine Engineer and boatbuilder at Mosman, is how well they rowed. The Avalon farm of the Fox Family - Warringah Shire Council took land from the Fox family to build Central Road - there is an item in Council Meeting Records, dated 2.9.1934 where: "H. Fox, 2/9/34,. again drawing attention to the state of Central Road, Clareville in front of his house, and suggesting that it be repaired with metal. Referred to the Engineer for report. " " Well my brother (Vincent) was great on rowing, sculling or rowing. My brother came rowing at Bayview, so I used to come with him and that's how I met my husband. My husband was in the same thing. He was a boat builder at Bayview. One of the first boat builders there. It's about, I think it started up about 130 years ago. " Cedric Moreton Williams and Vincent Henry Fox were peers, both born in 1904, both the sons of gentlemen who, although they had clearly had the benefits of a good education, preferred to be on the land and among the sea breezes, and both of whom had had some connection with amateur rowing from their early years. The Pittwater Regatta revival in 1921, after being put on hold during World War One (from 1914), may have been the inspiration for these then 16 year olds. In 1921 the year actually opened with a Pittwater Regatta, held on Saturday January 1st, New Year's Day, and closed with a Pittwater Regatta, held on December 31st, 1921. Pittwater Regatta is to be held on Saturday (1.1.1921). What memories come crowding upon many a sailing and rowing man at the revival of this wonderful picnic regatta. When war broke out in 1914 the regatta was held over, for the reason that so many of our good men went away at the call of Empire. But the war is over, and the light-hearted aquatic enthusiasts will have their regatta again. To John Roche, hon. Secretary, organiser and founder, is due most of the credit, for he has made this Pittwater regatta his hobby, and this year his efforts amount to a record entry for all events. It is particularly gratifying to note that in the sailing and motor boat sections the entries far exceeded all expectations; in fact, so far as the Sydney amateurs are concerned, there will be more starters than for any of the club’s Sydney Harbor races. The attendance is bound to be large. The beautiful stretch of water upon which the events will be contested is one of the most picturesque portions of the Hawkesbury. The rowing included events and those entered listed prior to the January 1st event for handicaps includes a who's who of Pittwater residents - many of whom the young men would have met - Careel Bay residents Wilson and Hastie among them and who won the men's double sculls during the New Year's Day regatta for 1921. Ladies Double Sculls All comers Handicap with coxswain- E. Harrison and P N Sutherland 40s M and E Gray 25s, O Griffiths and K. Boati, Mrs R. Hendrie and Miss A. Singleton 7s, Mrs Allan and Miss A. Trendle scr. PITTWATER REGATTA. Events for Rowing. 16ft to 24ft Local Boats. Garnet (F. Roche), 9m 1 Query (P. G. Taylor), 18m . 2 Lorelei (H. Gonsalves), 12m . 3 Other entries: Dorothy (W. A. Henderson), scratch; Don (A. Goddard), 7m; Merlin (C. J. 'Saunders), lim; Kiwi (B. B. Monckton), 10]m; Wybria (J. L. Williams)251m. Won easily by over 11 minutes. ROWING EVENTS. Girls' and Boys' Single Sculls. J. Erickson . 1 J. Loveridge. 2 J. Styles .3. Won by three lengths. Old Duffers' Single Sculls. J. Walsh1 W. Gray . 2 A. Henderson . ;.3 Won by one length. T. Price finished first, but was disqualified. Ladies' Single Sculls. Mrs. Notting . Miss Lipscombe ..'. 2.Miss Gray . 3 Won hy three lengths. Gentlemen's Single Sculls. J. Wilson . 1 W. E. Oliver . 2 A. .Erickson . 3 Won by five lengths. Gladstone Skiffs. C. Williams. 1 C. Erickson. 2 T. Russell . 3 Won by three lengths. Avalon Beach surf club's first structure and the formation of people patrolling the beach began amongst people who resided there and a gentleman architect, Bertram Ford, who was married to one of Australia's best lady rowers. A J Small's vision for Avalon Valley was for it to be a healthful sports and relaxing retreat - a golf course, tennis courts and a cricket pitch and other amenities may be seen in photographs taken when these developments began. The foundation meeting - on the steps stand Dr. Sydney dentist, Arthur Cecil Hanson with A J Small (second from left in white trousers) on his right, Stan Wickham (3.) and Bert Paddon (also white trousers - born 1906) to his left. 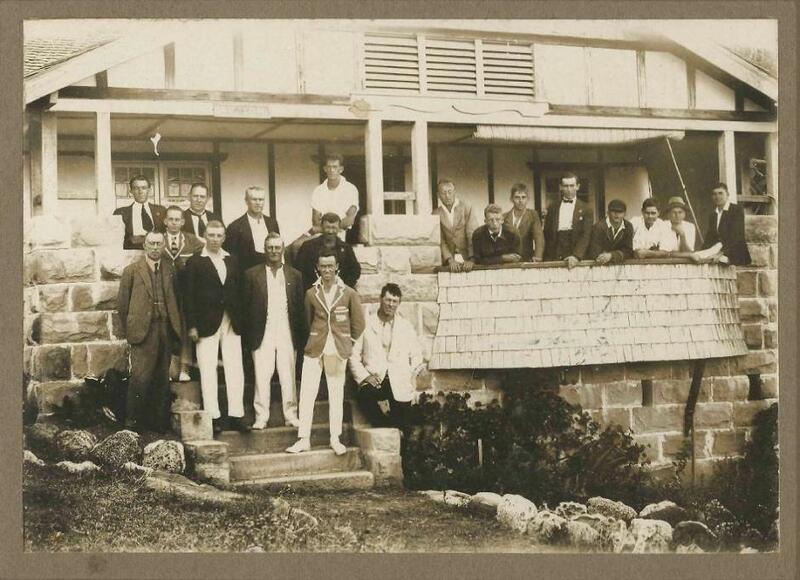 Also among these founders of Avalon Beach is A G (Tom) Hanson - verandah, and Small’s son Geoff is on the far right of the verandah, who was also in the first squad. Third boy from left in balcony bay alcove is Neville Fox, gentleman without collar back row of those on steps looks like Mr. Henry Fox while the tall lad beside him looks like Vincent. If you compare the faces in this picture with those of the Fox-Williams wedding picture and that of the Pittwater rowers at Parramatta in 1935 further down the page, a few faces are definitely the same. Also see the 1930-1935 photograph from the Williams Family Albums below when at Parramatta rowing event. Though the morning opened up fine, with a glorious sunshine, and the wind being of moderate strength from the nor-west, conditions altered remarkably before noon, and the annual Pittwater regatta on the magnificent waters of Broken Bay was spoilt. Even the spectators on the flagship Newcastle received a drenching. The spectacular side of the sailing events was entirely spoilt. There were many withdrawals, while capsizes, particularly among the open boats from Birchgrove and Lane Cove, were frequent President Oscar Curtis had the pleasure of winning his own cup — the Bona Cup— with Bona. Mr. Curtis was at the helm, and he scored a meritorious win over Aoma by a narrow margin of a few feet. There were some brilliant rowing finishes, particularly in the men's double sculls, four crews finishing within a length. Lieutenant Palmer, of the Bisley team, who arrived during the morning from America by the Maunganui, sailed his father's new yacht, Brand V., but was unplaced. Old Buffers' Race, 1/2 mile: A. Price, 65 years, scr, 1; G. Boulton, 67, 25 sec,2; R. O. Cummings, 63, 40sec, 3. Won by two lengths, with a. length between second and third. Boys' single Sculls, 1/2 mile: J. Jones,8sec, 1; Jack Loveridge, 2 6 sec, 2; K.H. Robinson, 30sec, 3. Won by a foot, -with a length, between second and third. Men's Single Sculls, 1 mile: First heat, W. Oliver, Gsec, 1; C. R. Richardson, 7sec, 2; c. Singlaton, scr, S. Second heat,C. Williams, 10sec, 1; F.Cooper, 7sec, 2; B. Paddon, 20sec, 3.Final, Singleton, 1; Paddon, 2; Williams, 3. Won by a length. Men'sDouble Sculls, all comers; C. Williams and C. Holding, 7sec, 1; V. Fox and B. Paddon, 22sec, 2; W. Warner and A. Erickson, 12sec, 3. Won by three feet, with two feet between second and third. W. Oliver and B. Oliver were only 2ft away fourth. Maiden Fours: North Shore (R H. Bolton 9.13, J. O. Littlewood 11.7 G. Moor 11.7. D. K. Smith 9.13, L P..Dadswell, cox), 1; University, 2. Mixed Double Sculls 1 mile: Mrs.J. Wilson and C. Singleton, 6sec, 1. Miss D. Williams and H. Erickson,5sec. 2; Miss A. Loveridge and E. Erickson 30sec 3, Won by half a length, with a quarter of a length between second and third. Gladstone skiffs, single sculls, for N.S.W. A.R.A. : D. Watt (Glebe), 8-10,cup valued at £10 10s, 1; T. G Blanchflower (North Shore), 11-9. £2 2s, ;; J.A. Goulding (Sydney), ]0.0, £1. 3. Won by two lengths, with four lengths between second and third. Surf boat race: North Steyne. £7, 1; Manly, £3 10s, 2; Deewhy, £2, 3. Won by two lengths, with two lengths between second and third. Gladstone skiffs, single sculls, local residents: C. Williams, scr, 1; C. R. Erickson, Esec, 2. Won easily. PITTWATER REGATTA. ENTRIES AND HANDICAPS. Old Buffers' Single Scull Handicap.-W. Gray, 20s; H Price, scr. Boys' Single Scull Handicap (l8 years and under)-William Hibbs, 15s; E. H. T. Robinson, 9a; Jim Loveridge, scr. Single Sculls (All-comers' Handicap).-First heat:I H. Price, 20s; W. Ellis, 14s; F. Roberts, 10s; J. Wilson, scr. Second heat: B. Paddon, 22s; J. Erickson, 14s; F. Roberts, 10s; F. Gallard, 5s; J. Toyer,scr. Gladstone Skiff Handicap.-H. Price, 25s; J. Loveridge, 20s; C. Holding, 15s; C. R. Dickson,10s; F. Smith, 4s; F. C. Erickson, 4s; J. Erickson, 2s; C. Williams, scr.Ladies' Single Sculls All-comers' Handicap.- Mrs. E.E. Hawkins, 21s; Mrs. C. A. Notting, 20s; Miss H. Lipscombe, 18s; Mrs. P. Allen, scr. racing boats, but as special arrangements have been made for their transport, risk of accident to racing craft is at a minimum! The flagship s.s. Archer will convey competitors and boats to the scene of the regatta, leaving the Hunter River S S. Co.'s wharf at 415 pm. on Christmas Day, arriving at Pittwater at 7.30 The Gladstone skiff race is sure to provide a keen struggle. The idea of the Christmas rowing camp was excellent, for outings of this kind cement' good-fellowship among the oarsmen of the various clubs as evidenced at the Toronto Centenary regatta, on Lake Macquarie in November, 1924. ?. A large marquee will be erected on Salt Pan Cove to accommodate oarsmen and their supporters.
" In her early 20s mum used to go and watch her brother row on Pittwater. Rowing, or sculling, was one of the main sports in the area at that time. This is where she met my dad, Cedric, who had also lived in this area all his life. Mum spent many hours watching her brother and my dad rowing. When mum wasn't watching the rowing they went on family picnics. Families from all around the area gathered together and had many happy times making it a very social affair." PITTWATER CLUB'S REGATTA. Pittwater Aquatic Club will hold a three days regatta on Thursday, Friday and Saturday next on Broken Bay This will be the most important function held by professional scullers since the war and in addition to three State championships many handicaps for all classes of boats will be decided. The championships will be controlled by the NSW Professional Rowing and Sculling League ex world 5 champion George Towns acting as starter and umpire These events consist of the open best and best championship of NSW river course of three miles oíd an eighth the open Gladstone skin championship of NSW course one mile and a quarter, and the open heavy boat championship of NSW one mile Among the competitors will be such well known scullers as Tom Saul of the Macleay River, the Regans of Shoalhaven, A J Fisher of Parramatta and the Ericksons and C Williams honorary secretary of the club of Pittwater Saul during the last two years his secured seven wins and four seconds out of 14 starts on the North Coast from scratch. The M S Gloria will follow all events and will call at Newport and Bayview each day. AQUATICS. B. PADDON A COMING SCULLER. LONG-MARKER F. SMITH, off a minute, won the professional sculling handicap in best and best boats at Pittwater yesterday. Men's Best and Best Boats for Fox Trophy.—Final: F. Smith (6secs. ), 1; J. Hanlen (36secs), 2; C. Williams (scr.). 3. Won by 2 feet, with 1 ½ lengths between second and third. The Penniman trophy was won by V. Fox, who In a Gladstone skiff, throughout the season, recorded the most consistent times. PITTWATER Amateur Aquatic Club yesterday had the biggest day of its career since it linked up with the lilywhites. Excellent racing was witnessed at Bayview, and V. Fox proved a slippery oarsman to pull off the big event of the day— the Gladstone skiff handicap for seniors. PITTWATER AQUATIC CLUB. Junior Gladstone Skiffs: G. Hickson, 6 1secs., 1; C. Klassenbock, 16 sees.. 2; D. ,McPhee, scr., 3. Won by 5 lengths. THE Fox Bros., who row at Pittwater give promise of developing into clever amateur scullers. V. Fox was the most outstanding yesterday, and showed all-round cleverness to romp home a winner by two lengths. J. Erickson was the best of the pros, to finish second in the main event at Broken Bay. Giving away long starts, he was beaten by only a length by G. Hastie, who was on 38 seconds. PITTWATEB AQUATIC CLUB.— Outrigger Handicap: V. Fox (28secs.) 1, A. Fryer (36sec) 2, N. Fox (48sec.) 3. Won by two lengths; half a length between second and third. Youths' Gladstone Skiffs. — First Event: D. McFee (21sec.) 1, P. Aldridge (scr.) 2.Won by a length. Second Event: G. Leach(17sec.) 1, C. Hickson (21sec.) 2. Won by a length and a half. Final: G. Leach 1, P. Aldridge 2, D. McFee 3. Won by a length and a half; a foot between second and third. SHOCKS galore were served up in the annual Leichhardt regatta on the Iron Cove. Two country clubs, Nepean and Pittwater, put it all over the locals in the events for Maiden and Junior men. NEPEAN won the Lightweight Maiden Fours, while Pittwater took the Maiden Eights, and Heavyweight Junior Fours. Nobody expected the crack North Shore senior eights to be beaten. The Police Combination, stroked by Rugby Union footballer, Wal Mackney, rowed a meritorious race to give the dark blues the shock of their career. A newcomer, N. Hobson, took the sculls. He has the making of a clever exponent in an outrigger. LEICHHARDT ROWING CLUB(Iron Cove Course. )Heavyweight Maiden Fours Event 1: Bydne? (T Johnston bow; W. Atkinson, V.Cogswell, R. Cooper, str. : J. Wallace cox)1- Balmain 2: Pittwater, 3. 21 lengths; ilength. Time. e.JJ 3-5. Evrat i: I*tehtart»(L Carey, bow; J. Angus, D. Morris, V.McCallum, str. ), 1; Haberfleld No. 1, 3; Balmain No, 2, 3. I length; a canvas. TUneV6.24. Ploal: Haberfleld No. 1, I: Sydney SiBalmaln. 3. 3 feet: 2 lenrths. Time, «.13 1-S.
Maiden Eights.— Pittwater (L. Moore, bow; H. Hickson, F. Smith. M. Moore, A. Pryer, V. Fox, N. Fox, Cedric Willlams, str. ; B. McFee cox 1; Mosman. 2; Drummoyne, 3.Two lengths: three-quarters of a length. Time, e mlno. 34 secs.Lightweight Maiden Fours.— Event 1: Nepean (L. Elkington, bow; E. Oorman, J.Reddan, J. wltu, stroke; II Reddao, cox).1; Sydney No. 1, 2: Haberfield No. 3. 3. 1 .1 lengths; 2 lengths. Time. «.48 3-6 ieu.Event 3: Sydney No. 2 (M. Lyons, bow; X.Webster, D. Little, A. Webster, str. : D. Watts,cox). 1; Mosman, 2; Haberfield No. 3, 3. lengths; I length. Time, 6. 38 1-5. Final Nepean, 1; Sydney No. 3, 3: Sydney No. 1, 1.3 feet; 2 lengths. Time, e.41 1-6.Handicap Sculls: N. Hobson (Leichhardt)i,1; A. Crockett (Balmain), 2; J. Barringhara(Leichhardt), 3. Two lengths; on length.Time, 6.4S. ROWING. SYDNEY REGATTA. North Shore Wins Eights. PEARCE BEATS TURNER. The Sydney club held Its regatta on the Parramatta River on Saturday, under conditions which were as bad as can be remembered on the historic course. A gale blew from the south-west, the rough water making conditions trying for competitors. Several boats swamped when the crews and scullers were battling up against the wind to the start. The main event, the senior eights, over 2000 metres, attracted unusual interest, as the crews were keen to measure blades again with the Police crew after its easy victory at Henley-on-Yarra a couple of weeks ago. North Shore had a brilliant victory, beating Sydney by a length and a quarter, with Mosman third a length further back. Police had to row hard over the final stages to finish level with Haberfield in last place. The conditions called more for watermanship than power. F. Grace, who stroked for North Shore, got the lead early in the race, and kept his crew rowing a bright stroke throughout. Taking full ad-vantage of the following breeze, he opened out to a lead of two lengths before reaching Cabarita, and was able to nurse his crew over the rough water crossing Hen and Chicken Bay. Sydney, with scullers W. J. Bradley and J. A. Goulding In the boat, did well to row Into second place. Mosman, with a comparatively new crew, put up a good race. Police, the heaviest crew in the race, could not get the full benefit of Its power In the rough water. HEAVYWEIGHT MAIDEN EIGHTS. Sydney.-N. C. B. Gelke, 10st (bow), W. J. Atkinson 105t 12), J. H. Young, 11.8 (31, P. G. Montgomerie 11.7 (4), H. W. Addison, 11.7 (5).W. J. Foskett, 11-4 (61, V. J. Cogswell, lost17), R. H. Cooper, 0.13 (stroke), H. F. Kerr (cox); R. C. crebbin (coach) . 1Police.-H. Hollis, 11.12 (bowl, N. Hogan, 12st (2), R. Laughton, 12.4 (31, R. Williams, 12.5 (4), J. Hinxman, 13.4 (51. J. Davies, 12.8 (6), G. Cannaco«, 12.7 (7), A. McFarlane, 13.2(stroke), T. Casey (cox); C. Hurley (coach) Mosman.-P. Tulk. list (bow). K. Downes, 12.7 (21 O. Neville, 13sl (31, A. Sparkes, 12.2 (41, R.Bertram, 12.3 (51. J. Moore, 12st (6), D. Wat-son, 13st (7), w. Watson, 10.10 (stroke), P. Adams (cox); R. F. Saville (coach) . 3Three lengths, six feet. Time, 6m 5.Bs. NOVICE FOURS.-1m. Haberfield. P. Curry, 9.7 (bow), R. Buist, list (2), D. Thompson, 11.2 (3), J. Williams, 10.6(stroke), R. Briggs (coxi; R. Halpin (coach) 1Mosman.-G. Belot, 9.8 (bowl. B. McCoy, 10.2 (2), J. Culpin, lOst (3), G. Vote, 10st (stroke), O.Dooley icox); P. J. Pddlngton (coach). 2Six lengths. Time, 3m 35.6s. 2000 METRES SCRATCH SCULLS. C. Pearce, 13.2 (Balmain), 1: H. J. Turner, 12.1(Police), 2; G. Clubb, 11.8 (Sydney), 3. Length. Time, 7m 20.4s. HEAVYWEIGHT MAIDEN FOURS.-Him, FINAL. Haberfield: C. Kidd 9-1 tbow), C. Lockwood, 11 121, B. williams 11 13), A. Blunden 10-6(stroke), W. winkworth (cox), E. Firth(coach) . Glebe: R. Cook, 11-10 (bow). H. Stone 13 (2), S. Arbell 11-6 (31, K. Hunter 11-10 (stroke),H. Wilkinson (cox), R. Simpson ' (coach)North Shore: P. F. Robinson, B-13 (bow), P. Robinson 10-4 I2i, L. Barrett 10-10 (3)J. F. Standish 10-B (stroke), D. Reid (cox),F. S. Grace (coach) .Fourth length, three lengths. Time, 6m 28.8s. 200 METERS SENIOR EIGHTS. North Shore: N. Higgs 11 (bow), R. R. Moody 12-5 (2), J. F. Watkin 12-0 (31, J. G.Myers 12-6 (4), D. O. Dawson 12-13 (5),G. D. Macpherson 12-12 (6), B. A. Willis12-5 (7), F. S. Grace, 12-4 (stroke), D. W. Bowden (cox and coach). 1 Sydney: J. A. Boulton 11-2 (bow), A. W. Sneddon 10-9 (2), R. J. Wise, 13 (31, J. A. Goulding 12-.4 (4), W, J, Bradley 12-10(3), W. J. Doxon 13-5 (6), D. E. W. Bain12-12 (7), D. A. Ellas 10-12 (stroke), H. F.Kerr (cox), W. A. Goulding (coach! ....Mosman: E. Gatenby 11 (bow), T. H. Glassford 11-10 (21, R. M. Bennett 12-2 13), W. Donnelly 12-10 (41, S. Cusack 13-4 (5), R. M.Smith 12-10 (6), M. L. Foote 12-2 (7). R.A, Pedlingham 11 (stroke), A. King (cox). LIGHTWEIGHT JUNIOR FOURS, 1 1/2 m. Balmain: V. Franklin 9-13 (bow), W. McManus 9-8 (2), B. Holt 9-7 (3), R. Williams 9-8(stroke), J. Andreoll Jnr (cox), J. Walker(coach . Sydney No. 2: N. C. B. Gclke, 10 (bow), W. ,T. Atkinson, 10 (2), V. J. Cogswell, 10 (3),R. H. Cooper 9-13 (stroke), H. F. Kerr (cox). R, c. crebbln (coach) . 2Sydney No. 1: L. Owens 9-13 (bow), D. Williamson 9-12 (21, L. Miller 9-13 (31, R.Rees 9-13 (stroke), D. Watts (cox), O. N.Rosevear (coach) . Last Saturday the Nepean was again the rendezvous of the State's leading oarsmen, when the N.S.W. Rowing Association held its annual championship regatta. North Shore, which has been very successful in senior events this year; carried off the big event of the day, the N.S.W. Eight-oar championship, in fine style, after being hard pressed by Pittwater, which made its first appearance in senior rowing, and whose performance must be classed as equal to Shore's in winning the event after a lapse of 44 years. The Pittwater club only made its first appearance in amateur rowing this year, and boating a crew of eight men, has won nearly all events entered for; carried off the Junior Pennant and is running second in the Premiership Pennant, which is truly remarkable for a new club,and leaves a hope that perhaps Nepean Club will some day win these laurels. However, unlike our local boys, Pittwater has the good fortune to be well supported by the Warringah Shire Council, which started the club off with a £1000 club house. "Mo" Reddan up in the cox's seat, rowed a good race, to be beaten by four lengths. In the maiden race for heavyweights the Nepean crew contained two new recruits to the club in Jack Hanney, a former city oarsman, who stroked the crew, and Charlie Ogilvy, a former G.P.S. oarsman. Arthur Stanton and Digger Price filled up the remainder of the boat, but they had to fight hard to keep up with the city lads, and were placed sixth. Two new coaches also made their appearance with these crews. Jack Witts had charge of the lightweights, and Bill Murray had the responsibility of the heavy crew. The day being perfect, it was expected that a large crowd would be present, but the Association had allotted different boating places to the clubs, which unfortunately scattered the spectators over a big area, and the day lost a considerable amount of its regatta atmosphere. However, the exhibition rows by the Empire Games crews made up for it to some extent, especially the Englishmen, who gave an amazing display of boat control, which was much appreciated by the spectators, who greeted them with a real Australian hand-clap. As usual, the local club had its ladies' committee in action at the afternoon tea booth, and, if the crowd of rowers around the booth can be taken as an indication, we would say that these young ladies looked really beautiful, in their aprons, done in club colours. Commenting on the Nepean as a rowing course, our visitors are certainly flattering in their praise, but when mention is made of the training arrangements and their accommodation at the Nepean Club, one wonders what really is the matter with the people of Penrith, when they allow a disgrace to be perpetrated like this. After listening, to their complaints we must agree that, when sixty men are asked to use two rooms ten feet by ten feet as a common dressing room and only one shower, they have reason to complain. Unfortunately the Nepean Club is bearing the brunt of these complaints, but when the true state of affairs is known, we can only thank our lucky stars that we have some real sportsmen in these boys. It is not perhaps, known but our local club has had to bear practically the entire cost of the housing arrangements for the visitors' boats, and when "the tumult and shouting dies" they are going to, find it most difficult to find the money to balance their budget. An instance of this was the recent transaction, with the Council, when the club had to pay£14/8/6 to have the ramp widened for the crews. So we hope that, if our visitors happen to read this article they will understand the position more clearly and not hold the Nepean Club responsible for their being housed like they are, but look a little higher tip the ladder. Four lengths, length and a half.Time, 9m. Champion Sculls of N.S.W.-3m. C. Pearce (Balmain.) ,. ; ........... 1W. Stevenson (Balmain) ........ . 2 Only starters. Quarter of a mile. Time, 20m 34.4s. N.S.W. Rowing Association is making another effort to bring rowing clubs on the Northern Rivers into the fold. Every concession within the bounds of the amateur definition has been put forward. There are great hopes of something definite being done in the near future. LISMORE club has already affiliated and the captain states his club is in a healthy condition, having a good credit-balance, a membership of 50, and a very- satisfactory fleet of boats. A new four has been ordered from Mr. George Towns, and a public subscription to provide funds for a new eight-oar boat is meeting with excellent results.' There are clubs at Grafton. Maclean, Woodburn, and other centres, but owing to some difference in regard to the amateur status of the members they have not yet joined up. As a further inducement the association has decided to allow the northern clubs to form a branch association in order that they may control their own races and regattas. In all other States, country clubs play an important part and are a big asset to the sport. Many of their crews have been successful in State championships, and in the case of Victoria, Queensland, and South Australia, have represented in interstate contests. An eight from Murray Bridge (S.A.)actually won the event in the years 1920, 1922, and 1923, and were also chosen to represent Australia at the Olympic Games, at Paris In 1924. ROWING. MOSMAN REGATTA. HABERFIELD WINS EIGHTS. Haberfield won its third successive senior eight when it retained the Boone Memorial Cup against crews from Pittwater, North Shore and Mosman, at the Mosman regatta, on the Lane Cove River, on Saturday. The crew showed its best form of the season in a closely-contested race. Taking the lead at half-way. Haberfield rounded the pile a few hundred yards from the finish, half a length ahead of Pittwater and North Shore, and rowing with nice judgment, it went on to win by a length. Pittwater beating North Shore by a canvas. Pitt-water rowed pluckily, , and, North Shore showed promise. The veteran Mosman eight, stroked by L. Callaghan, about a length behind North Shore, put up a creditable performance. Police boated a strong crew in the Maiden Eights, and won from Mosman by a length. Mosman, after dead-heating with Balmain tor second place in the Maiden Fours, won the final. Haberfield now has a big lead in points in the senior pennant competition, with Mosman in a good position in the junior division. Heavyweight Maiden Fours, 1m.-First heat: Police. 1: Haberfield. 2: Sydney No. '2. 3. Second heat: Sydney No. 1, 1; Balmain and Mosman, deadheat, 2. Final: Mosman (W. R. Evans, M. Ravell, L. Murray, D. C. Robins. K. Bursill, cox, D. O. Magoffin, coach), 1; Sydney No. 1. 2; Police, 3.Canvas, half-length. Time, 5m 25s. Lightweight Junior Fours, 1m_Haberfield (C. White. R. Stubbs, K. Love. Les. Robinson. W. Chandler, cox, Dr. J. A. Parkes, coach), 1: Balmain, 2, Nepean No. 1. 3. Length, two lengths. Time, 5m 55.2s. Maiden Sculls, 1m.-M. T. Wood (Police), 1; N. Hobson (Haberfield). 2; K. Webb (Haberfield), 3.Two lengths. Time, 6m 4s. Novice Fours, ½m.-Mosman (W. Whiting, P.J. Pennyquick, K. Wigney, S, Ritchie, R. George,Cox. C. Neville, coach), 1; Nepean. 2. Three and a half lengths. Time, 3m 20s Maiden Eights, 1m.-Police (E. Young. A. Birnie,L. Dunn. W. Farthing. R. Asquith, C. E. Sanders,H. Ferris. R. J. Douglas, B. Casey, cox, G. E. Hancock, coach); 1: Mosman. 2; Balmain, 3. Length, three lengths. Time. 5m 19.4s. My brother went into the business for a while too, but he did live in town because he was an engineer or something. One ended up at our boatshed, boatbuilding. The other one is a boat builder too but he went to Mosman to live. He got married so he went up there, so we have all been in boats. One of the boats Vincent built, which can't be seen too clearly - but he did make the papers at yet another Pittwater Regatta! GOING out to the motor cruiser Warrain, which was attached to one of the two guardships, the corvette H.M.A.S. Wagga, MICHAEL YELDHAM, MR. VINCENT FOX, the owner of the Warrain, MR. DEXTER MOORE, his daughter, MISS SUSAN MOORE, MRS. J. YELDHAM, MRS.MOORE, and MR. L. C'CONELL and MR. J. MUGGLESTONE. 3. Stanley Wickham, born 4th of January 1876 at Lucknow, NSW, went to school at the Parramatta Marist Brothers where he learnt the game of rugby. He played for the Parramatta Club in 1893 and 1894, then for the powerful Wallaroo side in 1895 and 1896. It was then off to the central west, where he represented Lucknow and played in Country versus City games from 1896 to 1899. In 1900 he was back in Sydney playing for Western Suburbs. He was to log up 87 first-grade games for his club. When the team to tour the British Isles in 1908-09 was announced, only the manager, Captain James McMahon, was named to accompany the team. There were also two Official Visitors, E.S. Marks and Frank Roberts. There was a public furore over Wickham’s omission, and a vehement public campaign led to his later inclusion as assistant manager. Coaches were frowned upon in those days, and the assistant manager could not have been labelled as the coach by the amateur moguls in the British Isles. All coaching was supposed to be done by the captain, who in this case was Herbert (‘Paddy’) Moran. The fine point of the tour contract was ignored, and Stan Wickham acted unofficially as the coach. The manager was also a recent player so the First Wallabies were well looked after in the coaching department. Historically in Lancashire, Chorlton-on-Medlock is bordered to the north by the River Medlock, which runs immediately south of Manchester city centre. Its other borders roughly correspond to Stockport Road, Hathersage Road, Moss Lane East and Boundary Lane. Neighbouring districts are Hulme to the west, Ardwick to the east and Victoria Park, Rusholme and Moss Side to the south. A large portion of the district along Oxford Road is occupied by the campuses of the University of Manchester, Manchester Metropolitan University, and the Royal Northern College of Music. To the south of the university's Oxford Road campus a considerable area is occupied by a group of contiguous hospitals including Manchester Royal Infirmary, to the west of which is Whitworth Park. The club soon moved to the River Irwell further upstream at Littleton Road and were based there for over a hundred years.However, in early 2000s, the stretch of river had been allowed to return more to reeds to support fishing and the boathouse lay on part of a new flood plain so the club moved to a new boathouse close to Manchester City Centre at Salford Quays. This new home triggered a huge growth in club size and successes throughout the UK. The club regularly competes across the UK at all levels and has a broad membership base, from complete novices and juniors through to semi-professional athletes competing at international level. The club regularly hosts a small boats head race in the winter and supports two British Rowing world class start coaches. FAMILIES OF IMMIGRANTS. ARRIVE AT SYDNEY BY THE TAHITI. VESSEL TO INAUGURATE THE PACIFIC MAIL SERVICE. San Francisco liner Tahiti was hauling alongside, after a continuous voyage from Plymouthto Sydney, via the Cape. The wharf was crowded with relatives, friends and nominators of the 300 immigrants who were on board. From the moment of her first appearance there was an incessant waving of hand and handkerchiefs, and bursts of exclamations. 'There sh is! There she is!' accompanied by excited gesticulations. This behaviour was indicative of one important fact— that those on board, or many of them were no mere 'speculators,' but that they were of that more desirable class, who were coming out to Join their husbands or relatives. There were numbers of children in arms, who clapped their hands, or stared bewilderedly at the strange scene. In all there are 75 children. The arrival of the Tahiti marks the beginning of the Sydney-Wellington-'Frsco mail service. She was formerly the property of Messrs. Elder, Dempster, and Company, employed in the West Indian direct mail service, under the name of the 'Port Kingston.' She was light in the water on arrival, drawing only 14ft forward when she came alongside, and this showed off her yacht-like lines to full advantage, she carries no cargo, and the long run has pretty well emptied her bunkers, thereby accounting for her towering so high out of the water. The ship is of 10,000 tons dead weight carrying capacity, and is driven by two triple-expansion engines and is of the two-deck type. The engines did not once stop during the passage of 36 days, which is claimed to be a record one. She steamed an average of 14 knots all the way. Smart as she appears externally, she looks smarter inboard, her sumptuously-fitted saloons, state-rooms, smoking rooms, etc. being equipped with all up to date requirements. Fine weather prevailed and the voyage was successful but for one exception. This was on Tuesday, November 7, when In about 43 degrees south latitude, she encountered tempestuous seas, which broke over her with terrific force. Five passengers were Injured. One lady fell and fractured her collar bone: an elderly gentleman broke his wrist and severely cut his head, and a boy fractured his thigh. Two stanchions were carried away. 'A lady was removed to Sydney Hospital on arrival to undergo an operation for appendicitis, from which she had been suffering for three weeks. Going down the list of passengers, it is intersting to note that there are many of the same name, either the whole or the balance of complete families: thus there were two families of nine, one of eight, two of seven, five of six, twelve of four, nineteen of three, and the remainder chiefly of two. Feeling the depressing effects of the heat and rain in Sydney, I decided to pack a few articles of clothing and make my way to the Central Railway Station. On arrival there, I made up my mind that I would go to the salubrious district of Orange. I took my seat in the train, and soon we were travelling at the rate of 40 miles an hour out through the suburbs of- Sydney, past Parramatta and Penrith. At the latter place we stopped for a few minutes for refreshments. The train making a fresh start, we went steadily along, approaching the new iron bridge that spans the Nepean. There was a great flood in this river at the time, and I felt rather glad when we reached terrafirma on the Emu Plains side. The -engine' driver put on speed again, and soon we were climbing Lapstone Hill, over Knapsack Bridge, through the railway tunnel, and then we were on to the Blue Mountains. Our train sped along at a great pace, the two engines that drew it making the valleys resound with their puffing. We arrived in Orange just about daylight. On the platform were a large number, of passengers waiting to take the train for their destinations. The bustling on the platform at that early hour shows that Orange is the centre of great traffic -to Wellington, Dubbo, Bourke, Molong, Forbes, Condobolin, and other important centres. The sun had scarcely risen, and the fresh, balmy morning air was something charming after what I had suffered in Sydney for the last four months. .1 put, up at Host Quinn's Railway Hotel, where I was made very comfortable, and after breakfast I went out to make myself acquainted with the important town- of Orange, about which I have heard so much. The main thoroughfare is Slimmer-street, which has many important buildings occupied by merchants and storekeepers, who are doing a good trade ; and the bustling in the streets and footpaths show that a considerable, business is going on in the town. A large number of business people and farmers, and also, numerous fashionably dressed ladies out for their afternoon's shopping, prove that Orange is a prosperous young city. There are to be seen, in Summer, Lord, and Beasley streets,; heavily-laden waggons drawn by fine teams of horses, conveying farm produce to' the various stores and the railway station. Careel Bay is a quiet, sleepy little place of about half a dozen cottages — several of them the week-end resorts of commercial men who repair there on Saturday and Sunday to enjoy the fresh breezes, the sunlight on the sparkling waters, and the back-to-nature feeling. One of those business men is Dr. Elliott, of Elliott Brothers, manufacturing chemists. He employs as a caretaker at Careel Bay an elongated gentleman named Charles Moule. Another resident is Mr. Addison Parker, who lives permanently there by the waters of the Hawkesbury. Now the wife of Mr. Parker was possessed of a dog of which she was very fond. It was the usual doggy dog, but rather well 'brought up' in that Mr. Parker had a properly wired fence constructed right around his property for two very good and sufficient reasons. The first reason was so that 'Buster'—for that was the animal's frisky appellation — could not get out., The second good reason was that other animals of Inferior social caste could not get in. They didn't. One day an audacious little Miss Doggie sauntered past the Parker domain, and 'Buster' was attracted by her charms. His monastic celibacy irked hira when he perceived this flapper addition to dogland strutting proudly about the domain of Careel Bay, frisking in the road, trotting off down to the water's edge, and generally enjoying almost unlimited freedom. So Buster broke out.. And that annoyed Mr. and Mrs. Parker. But it seems that Buster's personality also annoyed someone else — though who that someone else was still remains as big a mystery as ever, despite the amateur sleuthing that followed the sad demise of the well-known animal. One morning, sad to relate, the Parker household was moved to Its depths when the corpse of Buster was found In the yard, tail towards the kennel. Buster was no more. His spirit had fled, or flitted upwards to that land where all good dogs go when they die. Even as the Parkers were sorrowing over his remains he was, in all probability, wagging his spiritual tale, and chewing an ethereal bone in the blissful realms of the bow-wows' paradise. Now Mr. Parker was not the sort of man who dashes off into hasty action without some cold, calculating thought. He decided that he would personally unearth the foul conspirator who had deprived Buster of all the frisky frolics and bawling barks that might yet have beenhis had he stayed on this earth of mortal men. So, armed with magnifying glass, microscope, a keen mind, an eagle eye, a capacity for cross-examination and a determination to get to the bottom of the matter, he set to work. Where he did get is not altogether revealed. Where he thought he got was contained in a long and thoroughly interesting letter that he wrote to Dr. Elliott, and that letter, by innuendo, gravely concerned Moule, his caretaker. Dr. Elliott was In Japan, but a gentleman who had power of attorney for him got the letter, and referred It to both Moule and the Doctor. HER PET Meanwhile. Mr. Parker and his spouse called upon this gentleman and complained loudly. The result of the interview was that the gentleman made a note in his business diary that he had interviewed them and told them that he could do nothing about Moule until he had consulted Dr. Elliott. Parker subsequently wrote denying strongly that he had suggested that Moule should be sacked. 'I deny the false statement that I demanded the dismissal of Moule,' he wrote. 'I couldn't do such a mean, despicable thing, and nothing would be more revolting to me.' Anyhow, various cross passages, and such, didn't lead to anywhere in particular. The letter which Dr. Elliott got was in part, as follows:-— ? 'A little over four years ago we acquired a small Australian terrier which my daughter named 'Buster,*and she taught him many tricks.' A few months later my only child, Gladys, married, and has since lived In Queensland. This little dog has been my wife's dearest pet ever since.' The dog was well known from Palm Beach to Newport, and we are told that was fairly well behaved. Most people thought a lot of him.' On Friday, the 25th inst., he was murdered at about 2 a.m. It is known in Careel Bay that a great commotion took place at 2 a.m. at the back fence of your residence at Careel Bay.' A male resident says that another dog barked at the time, and drew his attention to unusual proceedings at your back fence.' An examination of the dog by experts proved that poison had not been administered.' The experts declare that the condition of the body showed clearly that nothing He had eaten had caused his death. He had not been chloroformed, neither was there any sign of violence from any sharp instrument, 'The experts agree that he was strangled by a human being.' The evidence shows that the dog was killed at about 2 a.m. on Friday. The body was carried past Hastie's and Howard's properties between 3a.m. and 7 a.m. until the public wharf was reached. THE MURDERER'S TRACKS 'There is a bend in the road at that point, and the dog was carried up a few yards on the track leading from the public wharf to my place. Here the culprit cut the tie from the dog's neck.' The article that cut the tie was discovered by two Careel Bay residents each in the presence of each other.' A powerful magnifying glass disclosed the fact that the dog had been laid down, and the tie cut down at that spot, but, the clumsy criminal left behind the article that he used for the purpose.' The culprit went a few yards up my track so that he would be off the main road, and could not be seen by a chance passer by.' He did not enter my western gate, but went down the track again, and entered by the eastern gate.' The bracken on this part of the ground had not been- trodden on for a month. The tracks of the man indicated that he was a tall man. He then proceeded up the ground from the front gate and kept under cover of the two humpies on my land.' He then deposited the dog in front of one of the humpies in such a position that the man was just concealed from any part of my cottage while doing so.' The evidence shows that in depositing the dog, he had a long reach and was a tall man. An examination of the ground under the microscope points to the fact that to clear an obstruction and still be concealed from my house he must have had a big reach to deposit the dead dog in the position I found it. 'The act is traceable to a clumsy, unintelligent, heartless and common man. The time it was committed, and the manner of its execution shows that it was cold blooded murder.' It is unthinkable that Hastie or Wilson would stoop so low. Furthermore, while Pulling was disloyal to his master while acting as caretaker, and proved conclusively to me that he was a dishonest caretaker, I would have hesitated before suspecting him of ill-treatment to a dumb animal. ''The wires at the bottom of my cyclone fence are only 3in. apart, and, of course, have vertical wires. Our dog never attempted to get out until the introduction of female dogs into the neighborhood.' Only recently we again patched up the fence where our dog had broken through, after your caretaker's dog. Lately his female dog has been wandering about past my place.' Would I be breaking any rules of neighborly etiquette in asking you to fence around your property. In such a manner that the little female dog that you are so innocently harboring can be confined to the precincts of your own property? 'That I took every precaution to keep Mrs. Parker's dog inside is undoubted. We chained him up for a week at a time until he got ill through want of exercise. SHERLOCK HOLMES'That with all our care we failed to keep him in, especially when the caretaker's dog came around, is quite true. 'That our dog was murdered at your back fence at about 2 a.m. is without doubt. 'Some men would have rushed to the police straight away, without employing Sherlock Holmes. 'Others would go to a society, or give the case to 'Truth/ 'Smith's/ or the 'Guardian. ''These methods are always available to anyone that may wish to employ them, without considering how innocents may become involved, or I should say embroiled— certainly not implicated. 'I believe that I have acted honorably in writing you. 'It just seems to me the way that men holding ideas in common should act towards each other. 'I offer you no apology for the length of this letter because my wife has not slept properly for two nights.She is on the verge of a nervous breakdown. 'She has always felt safe and secure in her cottage here, and at nighttime used frequently to go out by herself into the garden after slugs. 'She will not now go out of the door at night without I go with her. She dozes off to sleep for an hour and wakens up in a cold perspiration in a frightfully nervous state. 'Every little noise is, of course,some villain lurking about the place,and the usual investigations require to be made before she is satisfied. 'She has the feeling that Careel Bay now harbors a man of a brutal nature. She feels that this man maybe lurking about somewhere concealed at any time of the night, ready to carry out some other nefarious design.' She exhibits all the feelings of an hysterical woman that fears some further Impending disaster. Only for the fact that my daughter and son in-law are coming down shortly for a couple of months I would have packed her off to Queensland. 'Just what my future course of action will be will depend materially upon Mrs. Parker's state of health and the attitude you adopt.' Yours faithfully (Sgd.) ADDISON PARKER. 'P.S.— By the use of the words, 'caretaker's dog’ I do not mean that at this stage I have definitely established the ownership.' The evidence indicates that the cow and other stock are yours, and that practically everything belongs to you. My further researches disclose that the dog is not registered in Moule's name, I reserve the right to fix the ownership when further enquiries have been made.— -A. P.' One of the results of the letter, and subsequent letters was that Dr. Elliott informed Mr. Parker that if he was prepared to be reasonable about the matter, he had no doubt he could persuade Moule to settle the whole affair — this step following, of course, Moule's action against Parker, alleging libel. But Mr. Parker was adamant.' The defendant has been given three opportunities to apologise, and you are entitled to take his refusal into consideration when assessing damages,' said Mr. Owen, addressing the jury on Tuesday. Instructed by R. D. Meagher, he was appearing for Moule. Mr. Owen was opening the case to the jury, and he again extended to Mr. Parker an opportunity to apologise, and pay the costs incurred by Moule. At the conclusion of his address, Parker decided to take that chance. It was unexpected, and 'a surprise. But no doubt a reasonable step, for the question of who killed the dog didn't come into the matter. It was a question of libel, and the ground of defence, that the innuendo was not against Moule, did not seem too solid a base on which to rest a case.' The plaintiff is not vindictive. He only wants his name cleared,' said Mr. Owen, who went on to relate that he was now shunned by the people of Careel Bay and that little children ran away from him in the streets. A lamentable picture! But damages there were none, for the apology settled the whole matter. It was made in open court, and an agreement regarding expenses entered upon. Thus, in n brief twenty minutes' proceeding the ease collapsed and Mr. Moule had his name cleared, and Mr. Parker had the satisfaction that he had got out of an awkward corner. "The Shuttle of Life". When the wife and child of Lee Hing were sent out of Australia as prohibited immigrants, their vessel was wrecked, and they were drowned. Then a passion for revenge on Australia and the Australians possessed Lee Hing, and though infatuated with the beautiful Audrey Medden, he was heartless in his pursuit, and together in his toils used a hold on her worthless brother. The story is told by Mrs. J. B. Monckton, who was the founder and first principal of Meriden School, Strathfield (Sydney). Many ex-students of Hurlstone College, also, will remember her as Miss Bruce Webster. That was before her marriage to Mr. Walter H. Monckton, once a well known architect in Sydney. AQUATICS. PITTWATER REGATTA. The eighth annual Pittwater Regatta was held at Broken Bay on Saturday. Several close finisheswere witnessed in the rowing events. The weather conditions were admirable for the rowing competitors; but the light breeze told against fast sailing. ….' But the greatest demand this hot weather seems to be for land near the ocean beaches. At one time it was the cool mountain air that was sought, but now It is surfing and ocean breezes. Thus it is that the ocean beach frontages are more popular than ever for week-end lots, and some very big prices are being paid. As an instance of the demand there is for such land, it might be mentioned that on the holiday Messrs Raine and Horne conducted a sale of ocean beach frontages at Barranjoey. It is 17 miles from Manly, but the special coaches could not carry all the people that wanted to go out to the sale. Sale of Ocean Water Frontages. The same firm will also conduct a sale on the holiday at Newport, Pittwater, where there are sandy beach frontages in- the sheltered waters of Pittwater Harbour, opposite Scotland island, and only 12 minutes' walk ut the ocean beaches. The estate to be offered is the Clareville Beach subdivision, which adjoins the local public wharf, and embraces absolute-beach and water frontages, between Taylor's Point and --Clareville wharf; also campers' sites, overlooking the beach. Free launches will run from Bay View and Newport jetties on the day-of the sale, and persons wishing to inspect the land on Saturday can go by launch from the Hawkesbury River Railway station on arrival of the morning train from Sydney, returning from Clareville in the evening. Warringah Shire Council v Swan and another. In connection with the suit of the Council of the Shire of Warringah against H. B. Swan and A. G. Crump, In which the plaintiffs sought (or a declaration that portion of certain land fronting the waters of Careel Bay, in the Shire of Warringah, had been dedicated to the public as a public road, the case, by consent, was dismissed with costs. The defendants, who had sought to bring lands belonging to them at Careel Bay under the provisions of the Real Property Act, denied the dedication alleged by the plaintiffs. REMARKLABLE CONFESSION. Alleged Burglars Exploits. Norman Edward Keals, 27 years of, of Zealand, was before Mr S,ithers S.M., at the -Manly Police Court on Friday on several charges of breaking and entering and stealing. On a charge of breaking into Mr. Scott-l Fell's house at Mona Vale, on June 16, the evidence showed that the house had been left properly secured on June 3. Mary Rose M'Namara, who visited Scott-Fell's house on June 14, for the purpose of cleaning the place, stated that then she opened the door she found the furniture disarranged and the door open. She begun to work, when a man, whom she identified as the acused, came in from the court-yard. She asked him, "When did you come here?” He replied, "The day before,"
“on November last I was in Glenbrook looking for work. I came across a tent in Emu Plains camp belonging to Arthur Thompson. I wet into the tent and stole a bicycle from there. I rode the bicycle to Lawson and exchanged it for another which I found leaning up against a church. I afterwards saw in the papers that a young man named Ellis was fined £10 at Penrith Court for stealing a bicycle from Thompson's tent. I did not know Ellis, and he lad no part or share in the stealing of the bicycle. Afterwards I obtained a job on the railway at Glenbrook till February, when I left and went to Pitttwater. The bicycle I took from the church at Lawson I left in the bush at Glenbrook- When passing the Salvation Army Industrial Farm at Dee Why I entered the dining-room, where I obtained some food. I afterwards stole a bicycle from the outside of the shed there I rode the bike the rest of the way to Pittwater. That evening I entered Simpson's store at Bayview, and stole some tinned fish, biscuits. I postcards, and about 2/6 in silver; also some bottles of soft drinks. These things I put in a boat there, and sailed down the bay. I got into broken water, and the boat capsized: I got ashore on to the rocks, where I spent the night The next day I took a boat belonging to Dr. Stiles from the beach in front of his house (which I entered, and from which I stole some food) at Mackerel Beach, Broken Bay. I pulled to Careel Bay. I stole two coats, trousers, and shirts from a tent there. I went to Manly that night, and from there to Sydney, where I pawned my watch. With the money I received on the watch I paid my fare to Woy Woy, and got work at Wyong. I left there and went to Newcastle, and got work at Hexham on a farm. Then I went to Williams's place, outside Tarroo, and stole some clothes and money. Then I boarded a steamer at Newcastle and returned to Sydney. After working at Balmain for a while I went to Seven Hills, with the intention of leasing a farm there. I failed to get the farm, and on my return to Sydney I bought a revolver at Mick Simmons's, with which I intended to commit suicide. I went to Manly and to the Salvation Army Farm at Dee Why, where I stayed for a few days in a hayloft, and took some food from there, also from the Home of Rest. From there I went to Newport, and after a few days I broke into Scott Fells house at Mona Vale, and stayed there for a few days, and lived on the food that I found in the house. On June 14 I left Scott Fell's house, and went to another furnished cottage owned by Mr. Edward Scott-Scott, where I broke in, and remained until I was surprised by a party of weekend campers. I jumped out of the window, and ran away, but they caught me, and sent for Constable Hewitt, and gave me in charge. I wish to add that on my way to Pittwater the first time I entered the Salvation Army premises at Collaroy Beach, and stole a hymn-book. It is hereby notified, for general information, that the undermentioned persons have applied to LEASE for OYSTER CULTURE, under License or Permit, the portions of land set opposite their respective names. Tracings, showing the position of the several portions enumerated, may be inspected at the Chief Secretary's Department from Mondays to Fridays, between 11 find 3 o'clock; and on Saturdays between 11 and 12 o'clock. Any person may, by memorial to the Chief Secretary, within thirty days from the date of this Notice, and on grounds to be stated in such memorial, pray that leases of the portions may not be granted. Early Pittwater Paddlers, Oarsmen, Rowers and Scullers: The Fox Family of Careel Bay, Avalon and Clairville (Clareville) - threads collected and collated by A J Guesdon, 2015.